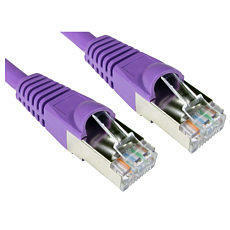 0.5m Ethernet Cable, CAT6A Violet. Category 6A Ethernet cable, commonly referred to as Cat6A, is a cable standard for 10 Gigabit Ethernet. The cable standard provides performance of up to 600MHz and is suitable for 10BASE-T, 100BASE-TX (Fast Ethernet), 1000BASE-T / 1000BASE-TX (Gigabit Ethernet) and 10GBASE-T (10 Gigabit Ethernet). It is backwards compatible with previous standards such as Cat6, Cat5e and Cat5. Flush Moulded Strain Relief: The flush moulded design allows the patch cables to be installed side by side in high-density network switches. The strain relief allows the cables to move without damaging the cable or breaking away from the connector while it is plugged in a device.